This research mainly focused on the relationship between financial effectiveness and the use of government subsidy in Land Readjustment (hereafter referred to as “LR”) in Thailand. The introduction of LR method in Thailand started in 1980s and finally established by the LR Act in 2004. As for the financial characteristic of LR in general, the result of literature review implies that self-finance principle can be achieved by selling the land called “reserved land”, which is contributed from the participants of the LR project. 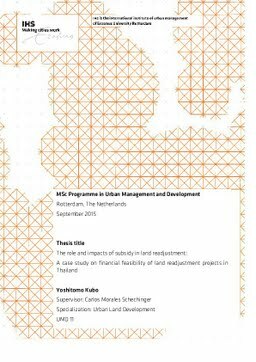 Since the existence of government subsidy in the LR project in Thailand is contradictory on this principle, the research tried to find out the role of the subsidy and its effectiveness by analysing the LR pilot projects implemented in Thailand. Research method utilized in this thesis is a case study by comparing three different pilot projects as well as the individual interviews with key persons in charge of the pilot projects. Two of the analysed pilot projects were applied for the government subsidy by means of loans and grant, and the other pilot project did not apply for the subsidy.